From the bottom of our barrel of new releases emerges a cassette demo, the nitre of the pits still clinging to it -- or perhaps that's its the toner of its low-fi black and white artwork. 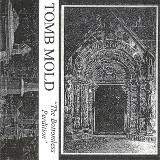 Such a release is Tomb Mold's new demo, The Bottomless Perdition, a noisy offering with some decent riffing, although it is way too early to say how the band's more polished products will turn out. A two-man band, Tomb Mold's vocal duties are undertaken by the drummer, MK. I'm assuming that he's singing through some sort of effects rig, as he goes for a vocal style that calls to mind an ancient force of evil, large, echoing, and completely unintelligible. Not that the listener is missing much, as the lyrics look like a Mad Libs game done by metalheads. The riffing is more interesting anyway, having a pounding, old-school vibe that's more like the thrashier portions of Death songs than more modern, technically-oriented stuff, especially on Bereavement of Flesh and the title track. On such as these, the duo's guitar/drum combo has a powerful energy, even without strong solos, a clean production, or lyrics that make any sense. I wasn't expecting much out of The Bottomless Perdition, but I found myself enjoying a few songs on there anyway.